This exquisite mug from Dunoon is designed by artist Aileen Morley is decorated with a peacock feather design, which captures the iridescent nature of the bird’s feathers beautifully. 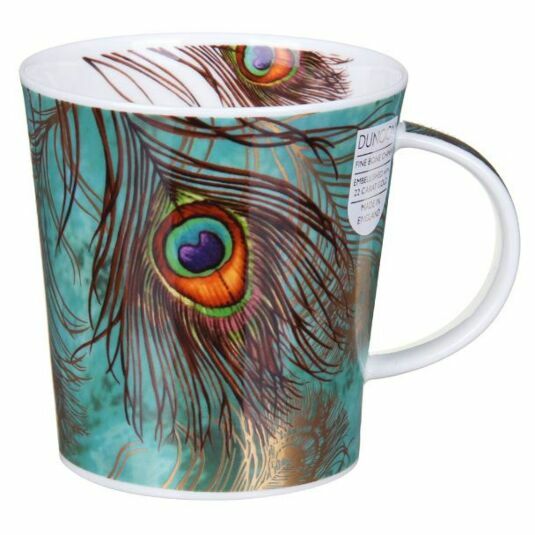 The orange, turquoise and purple centre is delicately portrayed, and the tendril-like filaments of the feather spread across the cup in an undulating pattern. The background of the illustration is a greenish turquoise, highlighting the colours and creating a strong background for some of the feathers which are picked out in gold. This mug exudes luxury and is representative of the finer things in life. A lovely gift for those who enjoy opulent interiors, exotic locations and the beauty of nature.